Hans Hollein (30 March 1934 – 24 April 2014) was an Austrian architect and designer and key figure of postmodern architecture. Some of his most notable works are the Haas House and the Albertina extension in the inner city of Vienna. Hollein was born in Vienna, and graduated in 1956 from the Academy of Fine Arts Vienna, where he studied in the master class of Clemens Holzmeister. During 1959 he attended the Illinois Institute of Technology and then in 1960, the University of California, Berkeley, where he completed his Master of Architecture degree. During these years he met Mies van der Rohe, Frank Lloyd Wright and Richard Neutra. In 1963 he exhibited, Architecture, along with Walter Pichler at Galerie nächst St. Stephan in St Stephen Vienna, highlighting their ideas for utopian architecture. Afterwards, he worked for various architectural firms in Sweden and the United States before returning to Vienna, founding his own office in 1964. 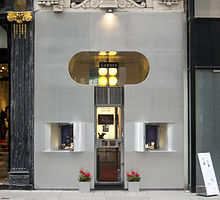 Hollein's early works were small scale designs, such as the Retti candle shop in Vienna, which notably featured a facade constructed of anodized aluminum. In 1972, Hollein designed a series of glasses for the American Optical Corps. Hollein was a guest professor at Washington University in St. Louis on two separate occasions, the first being 1963–64 and the second in 1966. During this period he was also a visiting professor at the Yale School of Architecture. He was a professor at the Kunstakademie Düsseldorf between 1967 and 1976, after which he became a professor at the University of Applied Arts Vienna. Hollein worked mainly as an architect but also established himself as a designer through his work for the Memphis Group and the Alessi Company. Additionally, he staged various exhibitions, including for the Venice Biennale. In 1980 he designed the stage for a production of Arthur Schnitzler's drama Komödie der Verführung (Comedy of Seduction) at Vienna's Burgtheater. In 1985 Hollein was awarded the Pritzker Prize. Hollein achieved international fame with his winning competition designs for the Abteiberg Museum in Mönchengladbach (1972–82) and an underground Guggenheim Museum branch in Salzburg (1989). The later hasn't been built, but his ideas for an underground museum still materialised in the Vulcania European Centre of Vulcanology in Auvergne in France (1997–2002). Starting from the late 1990s, Hollein designed large-scale projects, including bank headquarters in Lichtenstein, Spain and Peru. Starting from 2010 he worked with Ulf Kotz and Christoph Monschein at the Hans Hollein & Partner ZT GmbH. Hollein died on 24 April 2014 in Vienna, after a long illness, at the age of 80. His son Max Hollein is the Director and CEO of the Fine Arts Museums of San Francisco, the umbrella organization of the de Young Museum and Legion of Honor Museum. He is the former Director of the Städel Museum, the Liebieghaus and the Schirn Kunsthalle in Frankfurt am Main, Germany. ^ "Embarking into the Virtual World | Walter Pichler's Futurist Visions". ArtMag. Deutsche Bank. Retrieved 2018-12-02. ^ a b 032c.com. "HANS HOLLEIN: The Showroom Master". Retrieved 21 July 2014. ^ "American Institute of Architects" (pdf). p. XXXV. Retrieved 25 April 2014. ^ "Preisträgerinnen und Preisträger - Preise der Stadt Wien" (in German). Retrieved 25 April 2014. ^ "Österreichischer Kunstsenat - Staatspreisträger" (in German). Retrieved 26 April 2014. ^ "Reply to a parliamentary question" (pdf) (in German). p. 881. Retrieved 16 November 2012. ^ "Reply to a parliamentary question" (pdf) (in German). p. 1891. Retrieved 16 November 2012. Wikimedia Commons has media related to Hans Hollein.